These options give you the ability to choose how images are handled within Feed to Post. NOTE: The options for the feed source override the general settings for image options. From here you can choose the settings about images and featured images. Check this box to import the images from the posts into your local media library. Here you can set the minimum size that you would like for imported images (in pixels). This option applies to images saved in the media library as well as the featured image. 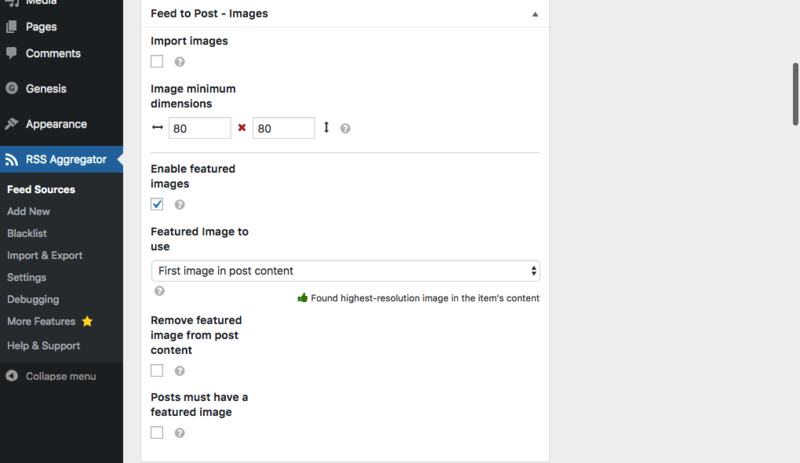 Check this box to enable featured images for imported posts. NOTE: When selecting this option the image used as the featured image is imported into your site, even if the “Save Images Locally” setting is unchecked, as this is the way WordPress functions. First Image in post content is recommended, as this will most likely be the most relevant image if no image is indicated by the Feed. The <media:thumbnail> tag, is used by a Feed as a featured image or thumbnail. If it is available in the feed, it is usually the best choice. The <enclosure> tag is also commonly used as a featured image or thumbnail. If no image is found when importing the feed, the fallback will be the default featured image. Lastly, experiment with these settings to determine which is the best to use for a particular feed source. We have also provided a few Advanced Image Handling tips for you to modify the imported images even further. Check this box to use the feed channel’s image, if available, before resorting to the feed source’s fallback image.